The first time I went to Bora Bora with my best friends and we were wandering around Pofai Bay we came across a little boat hire place quite by accident. We spontaneously decided to create our own adventure. Each couple hired a boat and we took off, in a group, around the lagoon. We enjoyed a spectacular day of freedom, snorkeling in places that are only accessible by boat. When I took my mum to Bora Bora I wanted to treat her to this experience. In 4 hours we had 3 great stops. The 'Aquarium' is a short distance from the boat hire place so we secured our vessel to a buoy and climbed off the back ladder clutching our flippers. This While we were swimming around this magnificent coral garden a dive boat pulled up and we observed each diver take the plunge to the bottom of the clear water and walk off way into the distance. This is my favorite spot for snorkeling in Bora bora's lagoon. Next we drove the boat into shore near the bottom of Motu Piti Aau. The previous day we had taken a boat tour and our Bora Bora tour guide had indicated that this was a rare private beach. After pulling our boat securely onto the sand, we walked along the water's edge, passing many private beaches, until we came to the southern most point of the motu. Here we walked into the water and put on our snorkeling gear, intending to catch a ride on the current back to our boat. We drifted slowly along, curiously observing the underwater terrain and occasionally grinned and gave the thumbs up sign, as we caught sight of each other. I floated past a huge, round cluster of bomb coral formed in a perfect circle. A group of spotted eagle rays were swimming together near the bottom and I excitedly turned back to point them out to my mum. 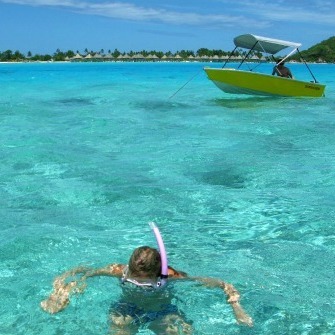 Being able to share astonishing discoveries contributes to the fun of snorkeling in Bora Bora.